The bubble had to burst sooner or later. 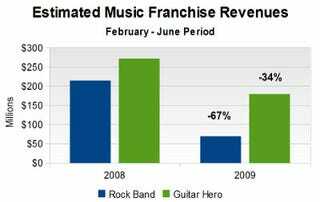 Digging through some NPD numbers from the past few months, Gamasutra's Matt Matthews has found that the amount of money made from copies of Rock Band and Guitar Hero is down 49%. That's compared to the revenue collected from sales of retail copies of both titles at the same time last year. There are a number of very good reasons for this: games have been heavily discounted in recent months as they age/take up floor space, and an increasing number of competing SKUs - we're looking at you, Activision - have diluted the marketplace. So this is bad news, right? Well, it's bad if you're Activision, the publishers of Guitar Hero. See, the sales of physical copies of these games tells only half the story. MTV are making a ton of money off Rock Band DLC. The sale of over 40 million tracks since launch has helped the franchise pull in over a billion dollars. So a decline in boxed copies of Rock Band hurts, sure, but Harmonix's commitment to a constant stream of downloadable content is translating into a constant stream of revenue for MTV Games. But Guitar Hero? Well, Activision seem to prefer packaging content at retail (Guitar Hero Metallica & Aerosmith, for example), and are either unwilling or unable to match Rock Band's DLC output, offering only three tracks here, three tracks there. Which means a downturn in retail revenue hurts Activision a lot more than it hurts MTV Games.